Is the planet shaking or it just me? 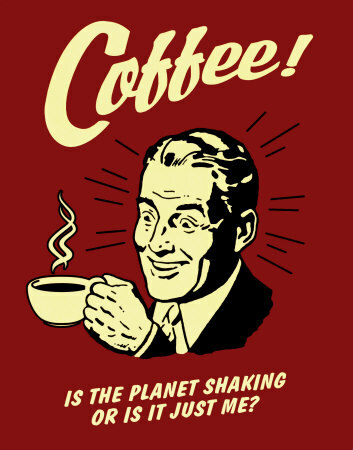 I’m a habitual coffee drinker, and I have people around me (doctors, mostly) poking at me to curtail the java for fear that I’ll develop some cardiac freak out stroke. And here I thought all that tapping and jittering was just because I liked the music. Once again, a new study proves them wrong. This one was supported by the Kaiser Foundation Research Institute and the Robert Wood Johnson Foundation, and guess what? Coffee drinkers may be less likely to be hospitalized for heart rhythm disturbances. And guess what? This report was presented at the American Heart Association’s 50th Annual Conference on Cardiovascular Disease Epidemiology and Prevention. A hot round of Joe for everybody, whooYA! Researchers found that men and women who reported drinking FOUR or more cups of coffee each day had an 18 percent lower risk of hospitalization for heart rhythm disturbances. Those who reported drinking one to three cups each day had a 7 percent reduction in risk. Moreover, the study was HUGE. It involved 130,054 men and women, 18 to 90 years old, with the majority less than 50 years old. The study also found that 2 percent were hospitalized for rhythm disturbances; 50 percent of those were for atrial fibrillation, the most common heart rhythm problem. The 18 percent reduction in risk was consistent among men and women, different ethnic groups, smokers, and nonsmokers. Update for 2016 from Medical News Today: Possible Health Benefits from Coffee. The news for coffee drinkers is getting better and better. In the study, 14 percent reported drinking less than one cup of coffee a day; 42 percent reported drinking one to three cups, and 17 percent reported drinking four cups or more each day. Only 27 percent were not coffee drinkers. The researchers examined hospitalization data by elapsed time after the initial examination. For hospitalization within ten years, the reduction in hospitalizations for people who consumed four cups of coffee or more each day reached 28 percent. In another subgroup analysis, the researchers studied people with and without symptoms or history of heart and respiratory disease. For both groups, four cups of coffee daily appeared to be associated with fewer hospitalizations for rhythm disturbances. Yeah. Or maybe they should just stop drinking that Ralph’s arf-arf brand “French Roast” swill.